Unions are far from dead in Wisconsin. Click image to watch a new one being born. The fight over unions is far from over in Wisconsin. Governor Scott Walker may have fended off a recall prompted by his dismantling of public employee unions, but the fever the fed the recall is sparking new private sector organizing. Palmero’s, a Milwaukee pizza factory that ships nationwide, will have a union election next month and the organizers say the immense public support for the recall gave the workers courage to organize. Palermo’s management obviously doesn’t want union. 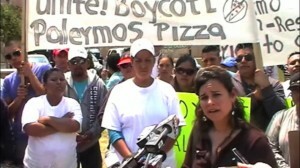 Strikers say Palermo’s has forced them to work sick or be fired. There have been complaints about how the company has dealt with injuries, fines from OSHA and allegations from workers the injuries were caused by the production line moving too fast. Strikers allege Palermo’s is trying to bust the union by firing people who walk out, changing the locks on the doors and calling in federal immigration to check workers’ legal status. The company flatly denies those charges, but obviously does not want a union. Company spokesperson Chris Dresselhuys told the Milwaukee Business Journal that the company would prefer to have “direct communications” with its employees instead of having to deal with a union. “However, the employees absolutely have a legal right to organize if they wish,” he said. “I have one comment with regards to a threat to call immigration and naturalization upon the workers. We don’t have a problem with illegal workers, we have a problem with illegal employers,” added Bryce. The union is asking consumers to boycott Palmero’s products until the company comes to an agreement with the workers. The Milwaukee Riverwest coop has already agreed to join the boycott. Union organizers say about 100 fast-food workers in Minneapolis walked off their jobs at about 70 stores. It was part of a nationwide strike that organizers say happened in 270 U.S. cities. Senator Al Franken (DFL-Minnesota) expressed his disapproval of striking down NLRB reforms which he said modernize and streamline the election process in which workers choose whether or not to form a union. President Obama has promised a veto.